9:30 is not the earliest start but we only have 15 kilometers ahead of us, many of them downhill. 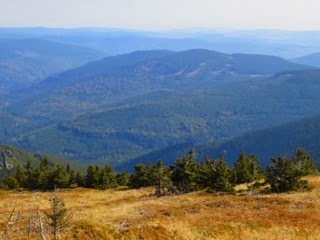 Our day starts on paved road leading all the way to the top of Praděd. It’s a walk rather then a hike. In the past there was an option to take a dirt trail on the other side of the mountain but now any pass other then the road is blocked and a sign asking visitors to stay only on marked path is posted. 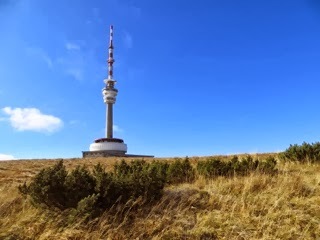 If it wasn’t for the fact Praděd is the highest mountain of the range and the whole Moravia, and it is possible to visit the platform 73 meters up the tower for views, I would be happy to skip this mountain. Especially on a day when cold wind blasts around in a speed of 20 kph. The next part of the route slopes downhill. The drop is gentle, and still on paved road but at least we are between trees now, for most part out of the wind. 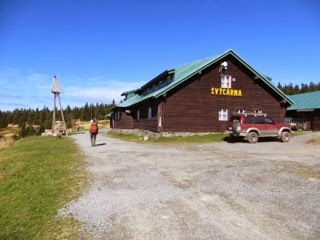 Švýcárna, an old salaš (residence of shepherds) welcomes us at 12:49. 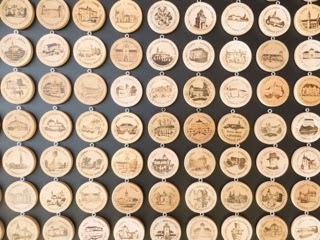 Today there is a tourist cottage here where hikers can warm up with a cup of tea or a bowl of soup. We have completed 7 km of today’s stage, with only 8 more to gone, we also sit down for a warm lunch. Following recommendation from an article I read about the traverse, we leave red trail here and continue on blue which should take us through more pristine scenery. We hike through forest, with some nice views. It is a pretty route but on a gravel path, too man made to our liking. When an opportunity arises to switch routes for more trail like path we take it. This pass is much more fun, muddier, trickier with roots and rocks in the way, much more our style. It takes us to yet another junction. Here we decide to reconnect with the red trail. We find it after a short climb. The trail runs the ridge and contrary to the description which called it “the most boring part of the traverse” we enjoy the open, exposed to wind trail with views and several short sections of steep climbing. 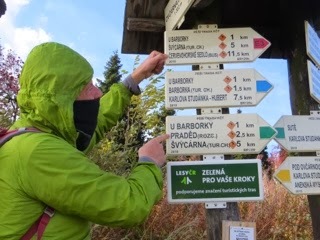 Eventually we start our final descend to Červenohorské Sedlo (Red Mountain Saddle) where we stay tonight. There are two choices here, the cottage and the hotel. We have accomodation booked at the cottage which is significantly cheaper but after seeing the room which consists of five old squeaky beds plus several pieces of very aged furniture from which parts are peeling, and dirty shower at the hall, we make a decision to pay extra for a room at the hotel, and the decision definitely pays off.